Grow your email marketing lists using ProProfs Training Maker’s integration with MailChimp. As soon as someone takes your course, you can automatically send their details (Name and E-mail) to MailChimp. *To Integrate Mailchimp with ProProfs Training Maker ensure your Name and E-mail tracking is on. You can enable tracking through the security section of the settings page. Step 1: When you log in to your account, under the desired course click "Settings." Step 2: On the settings page, click "Integrations." 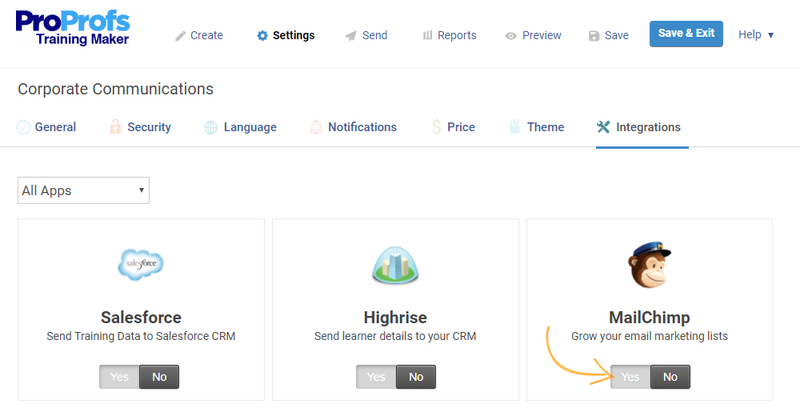 Step 3: Under Integrations find MailChimp and click "YES" to initiate Integration. Step 4: A pop-up will appear, click"Next" to continue. Step 5: MailChimp Integration Wizard will pop-up, enter the API key and click "Next". You can get the API key from your MailChimp account. Step 6: In the next Pop-up select a list to add learners' data, you can also opt for E-mail notifications by selecting the checkboxes. "Opt-In Email" will send a confirmation email to new learners while "Notify me" will send email notifications to you anytime a new learner takes your course. Click "Save" to complete Integration. Step 7: Your MailChimp Integration with ProProfs Training Maker is successful. Click "OK" to complete the process.